Nebraska announced that it will be wearing its annual alternate uniform on Nov. 10 against Illinois on Veteran’s Day weekend. 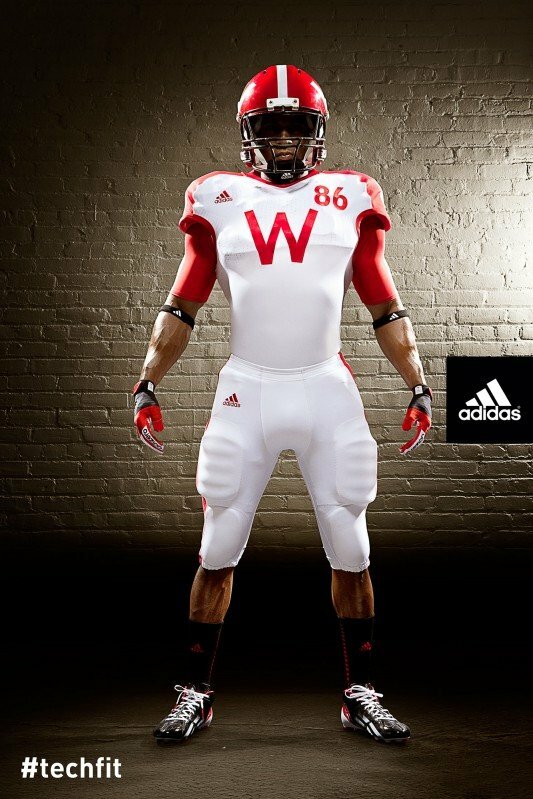 The uniform is intended to honor the 100th anniversary of the end of World War I, as well as celebrate Memorial Stadium. While there are any number of metrics available to grade uniforms (Brandon Vogel of Hail Varsity does a great job with his), I’m a fan of the UniWatch Blog system. It’s very simple: Good or Stupid? Clear and gets right to the point. So, on to the analysis. This is gorgeous. The stripes on the front and back were very common sights on football uniforms at the time. The numerals call attention to the Stadium Clock, which you can see inside the stadium and is a true hidden gem of Nebraska lore. Plus, it’s really close to the uniform idea that a smart and particularly handsome analyst had. And the “In the Deed the Glory” reprinted on the back is truly fantastic, especially since the original inscription has been covered by the new East Stadium façade. Good or Stupid? Really, really good. Hard to tell, as we really didn’t get a good look at the pants. Adidas refers to them as “buff” and supposed to resemble the original façade of Memorial Stadium. That likely means they’ll be some kind of tan. As long as it’s not too garish – and given that we didn’t see them at all, it’s likely there’s not much there to see – then they’ll be just fine. Good or Stupid? Too early to tell, but probably good bordering on meh. OK, so bonus points for trying to take the premise to its logical conclusion. And if your goal is to recreate a 1923 uniform, then I guess trying to make your helmet look like a leather helmet is admirable as a concept. But, seriously. No one is going to be giving you bonus points for historical authenticity. It’s ridiculous when the Green Bay Packers do it with their faux-leather pants. And it’s going to be ridiculous when Nebraska does it. The throwback is supposed to be an homage to 1923, not a slavish recreation. Heck, even looking at the 1923 University of Nebraska yearbook shows plenty of gorgeous art deco designs that could have been incorporated onto a helmet design. Instead, we’re going to see eleven of those on the field. At the same time. Playing modern football. Slamming against Illinois’ blue-and-orange helmets. That’s … going to mess up the historical authenticity. Good or Stupid? OH GOD THE STUPID IT BURNS!!!!! Well, the replica jersey is going to look amazing, and will likely be tops on my list of alternates to wear. The jersey is what most people are going to remember, and so the grade is going to be weighted heavily in favor of its sweet, sweet historical goodness. It’s going to stay in the Good category … but barely, given how ridiculous the helmet is. Good or Stupid? Good, but just barely. The infamous trash bag uniforms, which had numerals which literally couldn’t be read from the stands. The two-toned helmets were pretty cool, but overall the unis were a disaster. Mystifyingly, adidas took its disastrous 2014 concept and made just a slight tweak, putting it on a black background instead of a red one, and made the uniform only marginally less horrific. The only road alternates Nebraska has (yet) worn ended up making good use of the trash-bag silver, working them into an ice concept that ended up very sharp. The concept was brilliant, to pay homage to the 1997 team by replicating the mesh uniforms. And while it came out great, it was also hard to tell the unis apart from normal ones on the field during the game. Even early in the process, adidas got this one right. The basic black uniforms, the different-but-legible stencil numerals, and the overall simplicity gives this one a place of honor in the Nebraska alternate uniform pantheon. Fine, call it recency bias. But anything that involves old-school numerals, a shout-out to the Stadium Clock, and the full In the Deed The Glory inscription is going to be hard to beat. I’m not sure where the curly-Q numeral jerseys would fit on the above power list, but I’m telling you that it’d be way closer to one than seven.